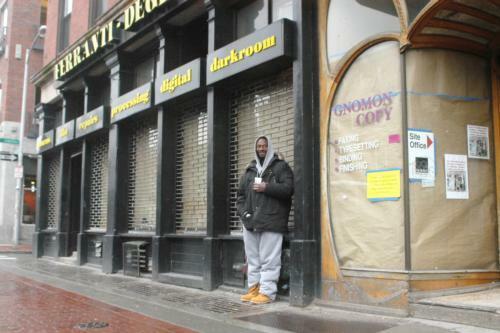 A homeless man stands outside the former Ferranti-Dege store begging for spare change yesterday. The number of homeless people in Cambridge is on the rise according to the city’s annual homelessness census. Homelessness in Cambridge has increased since last year, according to the city’s annual census of homeless people. There are 455 homeless people in Cambridge, 22 more than in 2006, according to the census, conducted in January. Nearly 12 percent of those individuals were not in any sort of shelter. Although this year’s increase may reflect more temperate weather—there was a snowstorm during last year’s survey—it might also demonstrate that homelessness is increasing, or that more people have relocated to Cambridge because of a lack of services in other areas, according to Meghan Goughan, director of the Cambridge and Somerville Program for Alcohol and Drug Rehabilitation’s First Step Street Outreach Program. Cambridge, like many other cities, sponsors an outreach program, shelters, temporary and permanent housing, and service programs for money management and substance abuse treatment. Fred Berman, a planner with the Cambridge Department of Human Service Program, said the city has invested a significant amount in affordable housing on a per capita basis. Gregory Daugherty, who sells copies of Spare Change newspaper in front of the Holyoke Center, said that Cambridge helps the homeless in more ways than people think. “But there’s just so many. We can’t help everybody,” he said. The census was conducted by seven groups of outreach workers and volunteers. Two Harvard students took part in the counting, which was done between 2:00 a.m. and 7:30 a.m. on Jan. 31. The 455-person estimate would put the city’s homelessness rate at roughly .4 percent, according to population data from the 2000 U.S. census. But some caution that the assessment may not reflect Cambridge’s actual homeless population. “I think [the homelessness count is] not necessarily a great barometer for the number of homeless people you might find out there on any given night, but it is helpful because it keeps people cognizant of the situation,” said Mallory R. Hellman ’08, who gathered data for the census and is the outreach director of the Harvard Square Homeless Shelter. In addition to raising awareness, the census can highlight trends in the shelter population—for example, whether there are more men or more women, Goughan said. “Most Harvard students’ involvement with the homeless community begins and ends with someone asking for change,” Arnold said. "The Big Freeze" (June 9, 2005): In spring 2005, Cambridge announced a “Ten-Year Plan to End Homelessness in Cambridge.” But several seemingly insurmountable obstacles lay in the city’s path including local real estate prices, the federal government’s limited definition of “chronically homeless,” and the number of poor individuals who continually flock to the city from across the Greater Boston area.